The whipped marshmallow crème center surrounded by the most delicious combination of gluten free milk chocolate and coconut is a unanimous favorite flavor combination for every chocoholic! 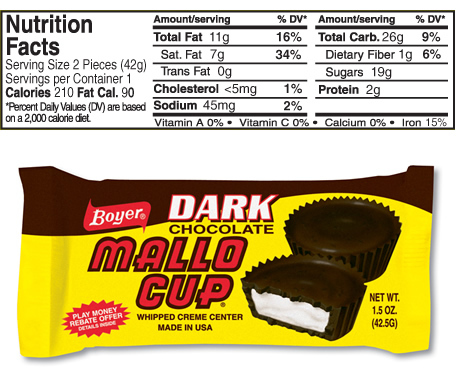 Mallo Cups are an American favorite and paved the way for cup candy in the United States. Boyer Candy has been making American made Candy for over 70 years, and our delicious kosher candy and gluten free candy is sure to satisfy any sweet tooth. From Smoothie Cups to Triple twist pretzels, chocolate candy is done best when it bears the Boyer Candy name. From the delicious and classic combination of our peanut butter cups to the smooth peanut butter and butterscotch flavor explosion of our Smoothie Cups, we’re sure you’ll quickly find a favorite Boyer treat if you haven’t already. At BoyerCandies.com, we carry a large selection of delicious American made candy as well as logo merchandise, corporate gifts, and so much more. When you’re looking to satisfy your sweet tooth and your wallet, shop BoyerCandies.com. We offer free shipping on all orders $75 or more!